Today’s BBC World report describes Kim Jong-un’s overall dissatisfaction with the weather in North Korea. Apparently he’d like something other than bad news...read it here. 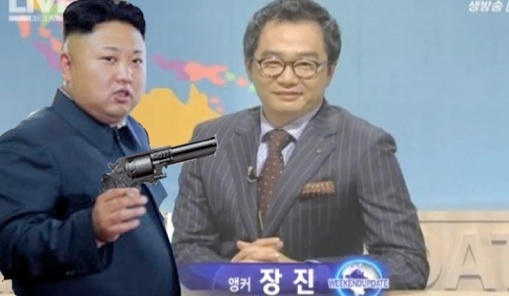 Our reporter was on the scene and managed to capture the image below while Mr. Kim was on the set of a Pyongyang weather broadcast, “Good Morning Super Happy Communist Subjects!” (a must-see broadcast: Really...you MUST see it or else) providing obvious encouragement to, “Do better” as he often says. Mr. Kim incentivizing Korean Weatherman.